Robert Metzger writes classic hard SF but he does so in a way that emphasizes excitement and adventure and which shows the science in a way that makes it accessible and fascinating. 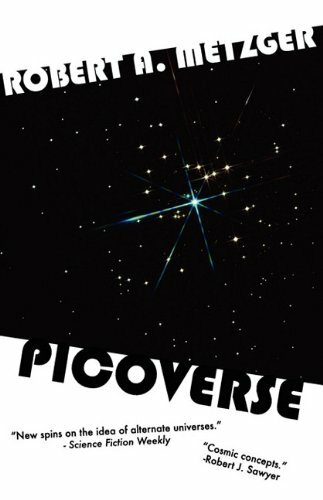 In PICOVERSE, a team of physicists in 2007 is trying to develop fusion power via a new development in plasma physics, a Sonomak, but accidentally stumbles on a method to create new, smaller-than-usual universes, which they call picoverses. These replicate everything in our universe but on a smaller scale. A disastrous test of the Sonomak machine shakes things up and a new project director, previously unknown to the group, is appointed. Alexandra has her own secret priorities and one of them is to escape from her superiors into one of the picoverses. To do this, she needs the researchers to execute her plan. Unfortunately, things go amiss and the team finds itself stuck in a picoverse duplicating 1920s Earth, but with its own version of a Sonomak, vacuum tubes and all. Among the local team are Werner Heisenberg and Albert Einstein. As the pace of the story accelerates, the original team races from one picoverse to another, trying to return to their home base and thwart Alexandra's plans. In a clash of alternate realities, the fate of Earth and the entire universe hangs in the balance. Cosmic rabbits need to be pulled from alternate universe hats before this tale comes to a satisfying--and scientifically rigorous--end.